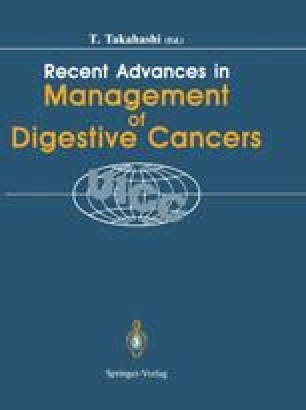 Application of endoscopic treatment for early gastric cancer seem to have been widely accepted in the recent years. To establish the indication of endoscopic therapy for early gastric cancer, results of 2072 surgery were reviewed:survival rate, complication, and lymph node metastasis. Local treatment by surgical endoscopy can eradicate early gastric cancer without lymph node metastasis. 631 cases of operated single early gastric cancer were studied to confirm which type of early gastric cancer has no lymph node metastasis. In using the mucosal resection method, a physiological saline solution is injected by means of a needle into the periphery of the lesion, thus inflating the lesion. Forceps are applied to the building portion to further raise the lesion and snare is set around for resection by high frequency coagulation. The Nd-Yag Laser with a power output of 50–70 Watt and irradiation time of 0.5 to 1.0 second was employed in the endoscopic laser therapy. We concluded that our endoscopic treatment is the ideal method for currative treatment of special type of early gastric cancer. Especially small tumor less than 1cm in size, ca.in situ and with no associated ulcer, those cases are most suitable, and absolute indication for the endoscopic treatment, and I think it is very excellent procedure as a minimally invasive surgery for gastric surgery.